Have you just started learning software programming, or thinking of becoming a Data Scientist? Python Courses will be the best for you. In this article, you will be learning what Python programming is! Python Courses is one of the most popular and most talked about programming language. It is used broadly in Machine learning algorithms, Web development, Automation, and other aspects of Data Sciences. But today, it serves as a default language for both Machine learning algorithms and Data Sciences. Over the years, Python programming has grown rapidly, this has, in turn, resulted in more programming opportunities for Python developers. There are a lot of Python programming courses out there, both free courses as well as paid courses. Free courses only offer the basics of python programming without going deep into it, but paid courses are more comprehensive. This can get you confused as to which one to settle for. The aim of this article is to share the best courses and how to get it for an extremely low price. We will give share with your courses only “Udemy” which happens to be the best online platform to learn new about new technology. Why do I recommend Python Courses in Udemy? You might be wondering why I recommend only Udemy courses over free courses on Edx, Udacity, and others. Well, the following are reasons why Udemy is the best online learning platform for Python courses. Don’t get me wrong, the Massive Online Open Courses on Edx, Udacity, and many others are awesome. But their tests and courses run for a long period of time, sometimes for months. This might lead to people losing interest in the courses. Udemy is comprehensive and straight forward with its courses. Buying a course on Udemy means you get full access to the instructor who takes you through live coding depth explanations. This gives Udemy a better chance over other sites. All courses on Udemy are designed to enhance your learning with notes, quizzes, assignments and many more including 3 major chances for you to create a Python project portfolio. When it comes to learning something new, Udemy courses are updated frequently, ensuring you always get the latest without paying for an upgraded course. Lastly, Udemy courses are always on sale all through the year, meaning at anytime, you can always get some of the best Python courses at affordable rates. Python programming is very vast, and to cover all areas might be a difficult task. As one of the top programming languages, we have put together Python courses for those who would like to learn. As a result of that, we will group the courses into three parts namely: Beginner Level, Intermediate Level, and the Advanced Level. With the grouping of these Python courses, it will be very easy for beginners, intermediates and even advanced learners. Being a beginner means you have little or no idea of this course, but nevertheless, all hope is not lost. Python is easy to learn for beginners, and at the same time advanced even for the pros. The Level is divided into two sections: First, for those with no idea of Python or any other computer language, you should get 30 Days of Python | Unlock your Python Potential. With this, you will be able to write simple scripts to automate stuff, create a program to handle trades even use Python for IOT, Web Development, Scrapping and more. Secondly, there is one for those with little knowledge of Python or other computer languages. If you are in this category, I recommend Complete Python Bootcamp: Go from zero to hero in Python 3. With this, you will Learn Python like a Professional! Start from the basics and go all the way to creating your own applications and games! This level is for those who understand the basics of Python, meaning those who are already good with object-oriented programming, who can read and parse emails using Python. So, if you need to take your skills a step further, the Python for Data Science and Machine Learning Bootcamp is highly commended. This particular course has an awesome number of 38,872 user ratings and over 195 thousand students have enrolled for it. 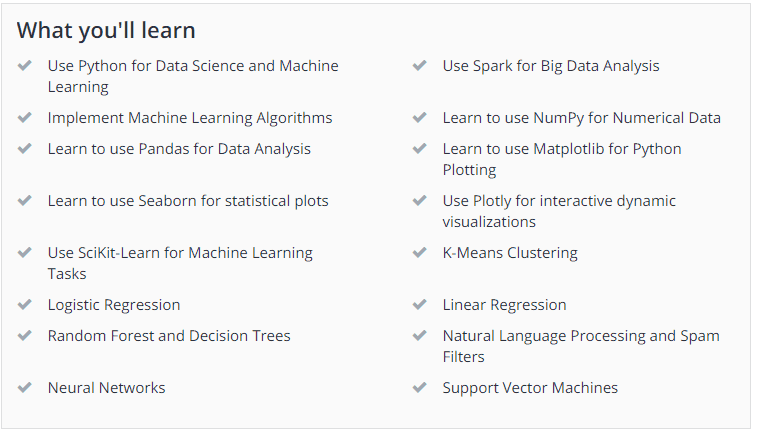 With this, you will learn how to use NumPy, Pandas, Seaborn, Matplotlib, Scikit-Learn, Machine Learning, and many more. This will prepare you for the second course which is The Python Bible™ | Everything You Need to Program in Python. This is a phenomenal course which is project oriented and it teaches you how to Build 11 Easy- Follow Python 3 Projects, and you go from Beginner to Pro in Python with the World’s Most Fun Project-Based Python Course. With an awesome rating and over 59,841 students enrolled. As an advanced Python developer who knows the basics of machine learning, how to use strings, Loops to Improve Efficiency and Maximize productivity, you can now dive deeper into data science with Python. Deep Learning A-Z: Hands-On Artificial Neural Networks is a highly recommended course for advanced level learners. This is where you learn how to create Deep learning algorithms in Python and Data Science. 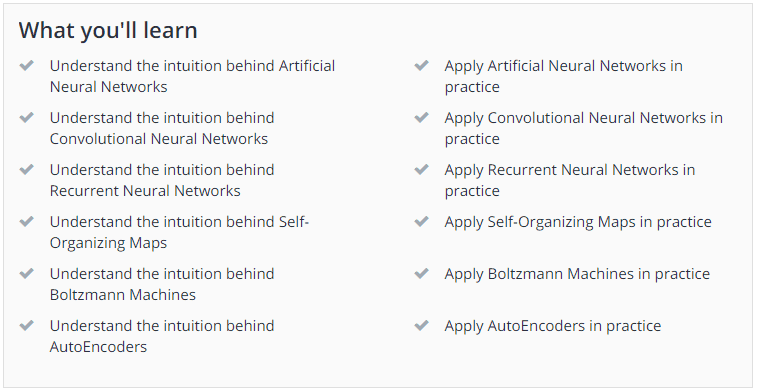 Fortunately, there is an amazing deep learning course with Python on Udemy. With an awesome rating of 19,292 reviews and about 151,665 students enrolled. This is just amazing for advanced level learners. The world we live in today is more advanced than it used to be decades ago. The demand for Python programmers is over the roof, and being a Python programmer with the knowledge of data science or machine learning can boost your capabilities to implement a lot of awesome and interesting stuff. This will also help you to stay up to date in the industry. Our list of Top Python Courses for Beginners and Masters on Udemy will help you get the knowledge and experience in Python Programming you need to solve Web Development, Automation or Machine Learning problems, which are in great demand right now. So, get a course today, give us feedback and follow us for more update.